Fleet Foxes and Sub Pop present a limited-edition collection in honor of the 10th anniversary of Fleet Foxes' debut LP. 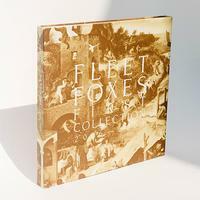 First Collection 2006-2009 spans the early days of Fleet Foxes' career, including the self-titled debut album, plus the Sun Giant EP, The Fleet Foxes EP (formerly a self-titled, very limited-edition, self-released EP), and B-sides & Rarities. The vinyl version is packaged in a lavish box, with a 12" LP of the debut album and separate 10" records for each of the added titles; the CD version has a separate CD for each title. In addition to its musical offerings, the collection features a 32-page booklet including show flyers, lyrics and artwork from band's early history. Fleet Foxes' debut album made a tremendous impact on the international musical scene, topping numerous "best of" lists, including Rolling Stone's 100 Best Albums of the 2000's and Pitchfork's 50 Best Albums of 2008, and earned the band Uncut's inaugural Music Award Prize. Fleet Foxes is certified Gold in North America and Platinum in both the U.K. and Australia. Fleet Foxes' most recent release was the critically acclaimed full-length, Crack-Up, released June 2017 on Nonesuch.